One of the so-called "true frogs", Bullfrogs are usually green to greenish-brown. Sometimes, partoicularly when found in the South, they are spotted. Their eyes are gold or brown and they have a broad flat head and body. They grow on average to be about 3 and a half to 6 inches (9-15 cm) long in bodylength (although there are records of some as big as 8 inches!! ), legs add another 7-10 inches (17 - 25cm) to lenght! Read more information on this subject in the Housing Your Pet Frog section. This is where things get a bit hairy for my taste. These guys have a voracious appetite and will eat anything that it can swallow, including invertebrates and small vertebrates such as mammals, birds, reptiles, fish, even turtles and other frogs. Bullfrogs have teeth in the roof of their mouth and a muscular tongue capable of flipping prey into their mouth. They'll eat lots and lots of really big bugs, fish (guppies, I am told, are pretty good feeders) and mice. Pretty much anything that will fit in their mouths. Large insects and worms should be left on the rocks, though these guys will eat them from the surface of the water too. Dead mice are best offered either by hand or using forceps (again, get the kind with round balls on the ends so you don't risk injuring the frog when he lunges at the food!) It is generally recommended that you house these frogs alone (except for breeding) in order to avoid cannibalism. Eeek! These guys can LEAP pretty big leaps!! Around 3-6 feet (1-2 meters) in distance! Bullfrogs are territorial and protect their territories by calls, displays, chases, jump attacks, and even wrestling. Male bullfrogs chorus at breeding ponds. Females also give aggressive calls and they respond to the breeding calls of the male frogs. Females are attracted to males with the territories that provide the most food. Male frog: "Hey baby baby baby! I gottem many bugs!" Female frog: "hey baby, I'll hop over to your pad tonight!" 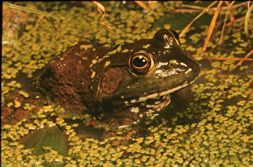 A female bullfrog may lay up to 25,000 small eggs that are held together at the surface of the water. When they finally hatch, bullfrogs tadpole can remain in that stage for up to 2 years! the longer the better,experts say, because it means that it will be a bigger frog and therefore have a better chance of survival! These guys are native to the eastern United States, ranging from as far north as Nova Scotia, all the way down to central Florida. They also live as far west as Wisconsin and the Rockies and were introduced widely throughout Colorado, British Columbia, California, and other western states. They tend to live in vegetation along the edge of large, slow moving, bodies of freshwater. Where they occur naturally, bullfrogs help keep down the mosquito and insect population. But in some places where they have been introduced, they eat so much that they can destroy local populations of native frog species! Their populations can bloom out of control because they don't really have natural predators (infact, they can give off some nasty toxic secretions from their poison glands (called paratoid glands) that can poison a dog if it tries to eat one!). The average life span for these guys tends to be around 4 to 5 years, though there are records of bullfrogs living as long as 6 or 7 years. Photo courtesy Ohio Department of Natural Resourses. Back to Species Info Page. Back to Frequently Asked Questions About Pet Frogs.